The Duffy / Murray pain scale. 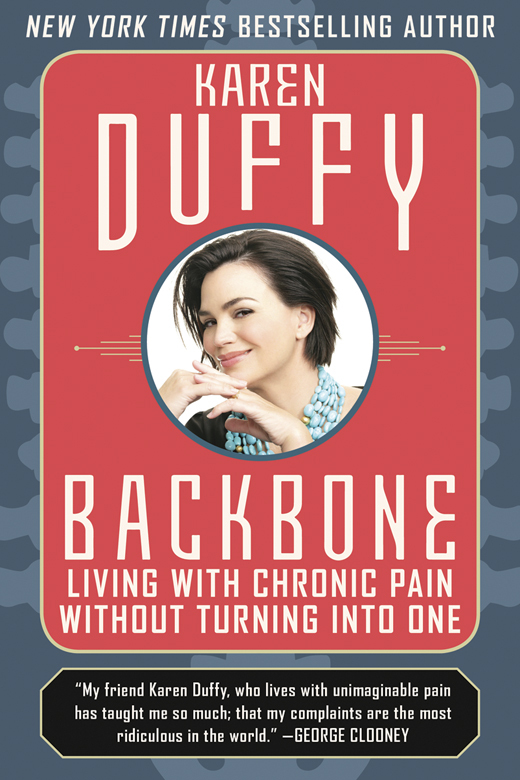 Karen Duffy writes about living with chronic pain. There is pain that hurts you and pain that changes you. Pain is a survival mechanism; it’s a signal that you need to pay attention to what is causing you harm – pull your hand away from the hot stove; jump back from the prickly cactus. Acute pain is usually caused by tissue damage and will resolve in a period of three months or less. “Acute” comes from the Latin root acutus, which translates to “sharp” or “pointed.” It hurts but it will resolve. You will heal. You will go back to the person you were before the injury. When the pain remains and goes beyond acute, it becomes chronic. This is the pain that changes you. With chronic pain there may be no visible injury. In many cases it is invisible, located inside the nervous system. The nerves never stop firing, sending constant signals to the the brain. These signals are your “Harm Alarm.” Except you can’t jump back from chronic pain. You can medically dull it or mentally distract yourself from it, but you can never escape chronic pain. “Chronic” comes from the Greek root khronos, meaning “time.” The pain is endless; chronic pain changes you. Over 115 million Americans live with chronic pain; one third of us are dealing with long-term physical pain. One of the many punitive effects of pain is that it is unsharable. Severe and prolonged pain is incredibly difficult to express. The reduction of language adds to the isolation that patients endure. The challenging effort to describe our state of being can compound the loneliness of a chronic condition. The inexpressibility and incomprehensibility of pain separate us from our friends and family. I have a serious illness called sarcoidosis of the central nervous system. It is a multi-system inflammatory disease of unknown origin. A healthy immune system defends your body from disease; with sarcoidosis, the immune system is what’s causing the problem. My body is making itself sick. Sarcoidosis causes the immune system to create inflammatory lesions called granulomas. I have cultivated a bumper crop of these granulomas in my brain, central nervous system, and lungs. Karen Duffy’s book outlining her experiences. My symptoms came on like a freight train. I woke up with an intense headache that radiated from my right ear to the top of my head and down to my neck and shoulder. At the time, I was working at MTV as a VJ (video jockey) I had been cast in a few films, like Dumb and Dumber, and was the Revlon Charlie perfume spokesmodel. I was in my early 30s, at the prime of my health, and enjoying a successful career as a writer and on camera. When I first got sick, I thought the doctors would figure it out and I’d get better and get back to my life the way it was before. It didn’t turn out that way. The disease has irreparably damaged my central nervous system. I never imagined that the pain was going to last 20 years, that it would be endless, and that I’d have to figure out how to deal with it for the rest of my life. My husband and son are lavishly healthy; they don’t fully comprehend what it is like to live in chronic pain. My guys are loving, compassionate, and funny, and like most people, they have a narrow frame of reference for how they have dealt with pain. Their sprains and stitches and dental visits are finite, a sprint through nagging discomfort. Chronic nerve pain is an unending marathon of physical distress. They can’t see the torment that bursts in my neck and ruptures through my central nervous system. They can’t see the agony of the evil parrot perched on my shoulder, digging his sharp, scaly claws into my shoulder and pecking my neck and head with its razor-blade beak. It is invisible. The English word “pain” is rooted in the Latin, poena, meaning punishment or penalty, as well as the sensation one feels when hurt. Chronic pain is like serving a life sentence. It is punishment for a crime you didn’t commit. Living with chronic pain is like living next door to a bully. You never know when he’s going to stomp over, ring your bell, and knock you on your kiester. Chronic pain and invisible illness are a part of me, and I am doing my best to peacefully co-exist with them. I try to keep the pain-to-fun ratio in my favor. I have learned that pain is inevitable, but suffering is optional. An eccedentesiast is someone who hides her pain behind a big fat smile. This is my approach to living with a chronic illness and chronic pain. There is evidence that the act of smiling makes you happier. I plaster on a smile rather than grimacing in pain. As Lord Byron advised, “Always laugh when you can, it is cheap medicine.” This is how I go on: smiling through the pain, trying to find a bright side. I have a serious illness, but I don’t take it too seriously. Every day we have a choice: be useful or useless. I choose to be useful, or I try to, and this contributes to my happiness. In a way, I am a very lucky unlucky person. I have found an upside to having my life turned upside down. Researchers at the University of Liverpool have noted that reading and cognitive behavioral therapy have similar effects on the brain. Reading can trigger positive emotions as the reader engages with a book. The investment in a story or a poem recalls positive memories and sends new pain-free messages to the brain. By reading Irish America, you are doing something positive for yourself.